Paul Bouscarle, a bowel cancer patient who recently underwent surgery at St. Mark’s Hospital, has organised a 280 mile cycle challenge to raise vital funds for St. Mark’s Hospital Foundation. 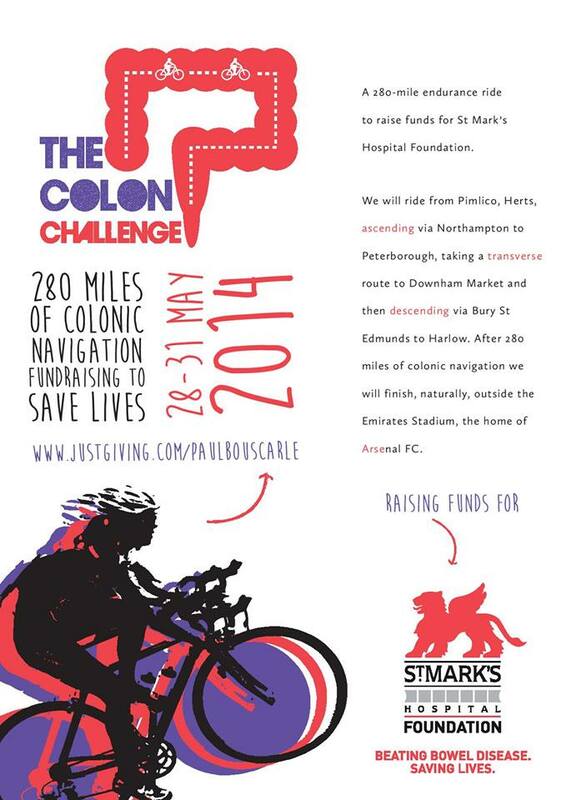 The Colon Challenge, which takes place from 28th-31st May, has a team of 16 determined riders who will be joined on the last day by Professor Brian Saunders, Clinical Director of The Wolfson Institute for Endoscopy at St. Mark’s Hospital, and Alex Burton, Community and Events Executive at St. Mark’s Foundation. Paul is particularly appreciative of the work of Professor Saunders , who over sees the Bowel Cancer Screening Clinic at St. Mark’s, providing early diagnosis and treatment of bowel cancer for a catchment area of over one million people. At St Mark’s, Paul was under the care of Mr Ian Jenkins, a leading colorectal surgeon. The Colon Challenge cycle route will trace the shape of the human colon, beginning at Pimlico, Herts, ascending via Northampton to Peterborough, transversing to Downham Market and then descending via Bury St Edmunds to Harlow. After a gruelling 280 cycle ride, the challenge will finish outside the Emirates Stadium, the home of Arsenal FC. The Colon Challenge has already raised over £22,000 for St. Mark’s Hospital Foundation, which will help St. Mark’s Hospital to develop new and better treatments for bowel disease. In the field of bowel cancer treatment, St Mark’s was instrumental in the development of endoscopy to detect and remove pre-cancerous polyps and pioneered the use of keyhole surgery for removing tumours in a minimally invasive way. St. Mark’s is carrying out a highly innovative range of research to better manage and improve treatment for all forms of bowel disease. This research holds out great hope of a better future for many thousands of people with bowel disease. St. Mark’s needs more donations in order to fund these ground-breaking projects. To donate to the Colon Challenge, visit www.justgiving.com/paulbouscarle. To find out more about St. Mark’s Hospital Foundation, the only charity dedicated to supporting research, training and education at the world renowned St. Mark’s Hospital in North West London, visit www.stmarksfoundation.org or contact Stephanie Van Der Wens at s.wens@nhs.net. * For more information regarding media usage, ownership and rights please contact St Mark's Hospital Foundation.